After a month-long dry stretch, Mother Nature decided to throw an extra challenge at racers in Wednesday’s Fox Air DH at Crankworx Whistler. But neither greasy conditions nor recent injuries could slow down the world’s top racers - Jill Kintner (Norco International) topped the Pro Women’s podium for the second year in a row, while Mick Hannah (Hutchinson UR) got back in the game in a big way, returning to competition leaving fear and a recent shoulder injury behind him. The win was especially key for Hannah who’s been sidelined for the past nine weeks after shoulder reconstruction surgery resulting from a crash in Fort William. Hannah said today’s conditions definitely made him a bit nervous. Coming in a close second place was fellow Aussie Chris Kovarik (Kovarik Racing) who finished just 1.2 seconds behind Hannah, while Danny Hart (Giant Factory) took third, 4.86 seconds back. Ahead of the men, the women took their turn to jump, scrub and whip their way down A-Line. Now in its 11th year at Crankworx, the women’s race has only seen a repeat champ one other time. Kintner’s win today, in 4:42.69, puts an end to that and reinforces her reputation as one of the most versatile female riders, especially given how physical track is. One step down from Kintner, Anneke Beerten (NED) took second place while Mick’s sister, Tracey Hannah (AUS), took third. A-Line is one of the world’s infamous trails - with 39 jumps and 30 berms over a 1200 meter vertical descent, its reputation is well-earned. 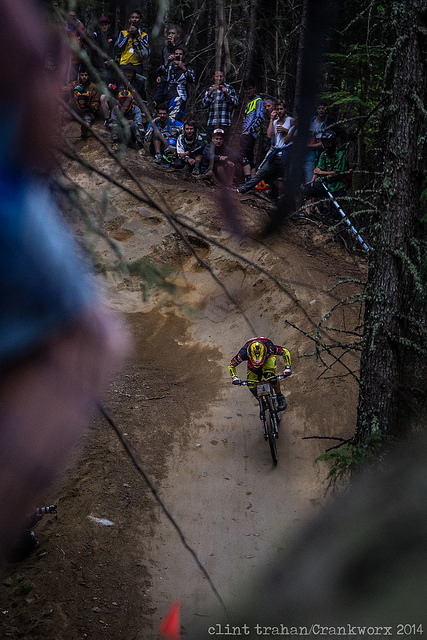 While the skill and speed on this challenging track earned Kintner and Hannah a spot in Crankworx history today, the vibe around the race is what most who watched the event will likely take away. The appearance of the Nitro Circus crew, including Travis Pastrana, racing with plate number 199, whipped the crowd into a frenzy. Meanwhile a series of stylish trains, including Eliot Jackson (USA) and Bernard Kerr (GBR) as well as the Masters brothers, Eddie (NZL) and Wyn (NZL), showcased just how much riders love this event. The most memorable moment of the day though came from French rider Fabio Cousinie (Hutchinson UR). Cousinie cruised into temporary first place in a button-up shirt and bow-tie - when approached by the broadcast host, Cousinie stole the show by getting down on one knee and proposing to his girlfriend, undoubtedly a Crankworx first. While Hannah’s winning time boosted him ahead of today’s contenders, it was still well under last year’s winning time - Steve Smith (Devinci Global Racing) won the Fox Air DH last year with a commanding time of 4:12:08. Smith’s absence has been a noticeable one in many of the downhill races at this year’s Crankworx - an ankle injury has rendered him unable to defend his titles from last year, including one of the most popular downhill races at Crankworx, the Canadian Open DH. Smith has won the event for the past three years. In his place the world will definitely watching Hannah to see if he can repeat today’s success, as well as Marcelo Gutierrez Villegas (Giant Factory) who smashed yesterday’s Garbanzo DH. Several other riders said to be competing are carrying some momentum from recent World Cup rounds, as well as past Crankworx races, including Troy Brosnan (Specialized DH), Danny Hart (Giant Factory) and Andrew Neethling (RSA). The Canadian Open DH at Crankworx Whistler is set for this Sunday, August 17, with amateur divisions from 11:30 a.m.-2:30 p.m. and Pro Division (live webcast on Red Bull TV and www.crankworx.com) from 3-5 p.m.